First Line: The clip-clop of the standardbred's shod hooves against asphalt echoed within the canopy of the trees. In moments, an Amish family's lives are shattered by a hit-and-run driver. Kate Burkholder races to the scene and finds it very difficult to maintain any sort of composure. This man... this father... and his three children are the family of Kate's very best childhood friend. That friend, the breathtakingly beautiful Mattie, may never recover from this horrendous loss. And it gets worse. As the evidence begins to be pieced together, what at first seemed to be an accident is now seen to be deliberate. Who on earth would want to kill an Amish father and his children? Burkholder wants answers, and she wants them now. What she doesn't want is for old history-- in the form of old bones-- to be uncovered at the site of an old grain elevator. The first part of this book concerning the hit-and-run and its aftermath had my heart in my throat and tears in my eyes. Having grown up close to an Amish community, I was there as those pages turned. 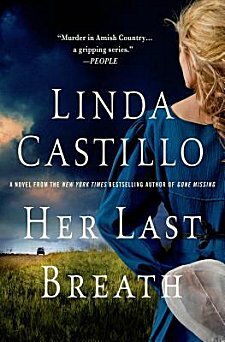 The world could've come to an end, and I would not have been able to stop reading Linda Castillo's words. If the book had been able to maintain that pace, I wouldn't be able to recommend this book highly enough. But it did taper off a bit. As to the identity of the killer... I hate to say that I wasn't surprised about that either. I'm inherently suspicious of particular situations and certain people. It's just the way I'm wired. Another way that I'm wired is to enjoy a good read. This book had an absolutely fantastic beginning, and even though I deduced what happened and was somewhat disappointed that Kate's past was rearing its ugly head again, I still found a great deal to enjoy-- and I'm looking forward to the next in the series. Cathy - Good point about Kate having to face her past! I'll admit I've not read this one yet, but I like the series and I agree with you that that element would add a lot to it. Thanks for the excellent review. You're welcome, Margot. A plot element like the one I described has a shelf life-- at least to me-- and that shelf life has expired. I think Castillo could have a winner of a book if she resolved it in the next book. Thanks! I like to read Amish mysteries, probably because I lived within a few miles of Amish communities in central Illinois. I listened to one of the books in this series and really liked it. I should get back to it. I liked the previous in the series..kate is a good character...so I will have to add this to the list! I really like this series and will be on the look out for this latest installment. I fell for this series very quickly, and I'm glad to see that you enjoy it, too.